About the Classic Chef KM331. It's also a class act for helping you to be a bit more adventurous with your cooking. Kenwood Chef Classic (KM331) Kitchen Machine | Introduction - YouTube. Whisk: Yes. 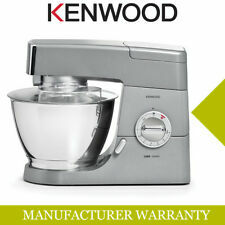 Kenwood KMX52 KMIX Stand Mixer. At 500W, the kMix kitchen machine is perfect for making even heavy dough loads up to 1.35kg. Kenwood kMix Kitchen Machines | Promotional Video - YouTube. Whisk: Yes. A test of good performance is how well the ingredients are mixed in the bowl. 1 Year Warranty. Available in 4 Colours & Attachments! About the Prospero KM240SI. Kenwood Prospero Kitchen Machine | Product Demonstration (long version) - YouTube. The Kenwood Prospero KM240 Series kitchen machine with stainless steel bowl is designed to make it easy for you to choose the right kitchen machine for all your usual cooking tasks. You can use this to make cookies, scones, cupcakes, cakes, bread dough and whipped creams can all be produced with ease using the stand mixer. It can also mix other foods such as mashed potato. -2 x Dough Hooks. About the Prospero KM283. Kenwood Prospero Kitchen Machine | Product Demonstration (long version) - YouTube. The Kenwood Prospero KM280 Series kitchen machine with stainless steel bowl is designed to make it easy for you to choose the right kitchen machine for all your usual cooking tasks. 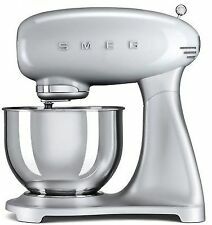 KitchenAid 5K45SS Stand Mixer. 5K45SS Mixer White. K45 Stainless Steel Bowl. Dough Hook. The Accents Stand Mixer features an 800 Watt motor with six speeds and pulse setting which makes easy work of mixes, batters, and dough’s to create delicious breads, cakes, pastries and much more! Product Detail's Folding: No Speeds: 6 Wattage: 800 Bowl Size: 5l Storage box: No Bowl material: Stainless steel Quick release mechanism: Yes Recipes: Within instruction book Attachments included Splash Guard, Beater, Dough Hook And Whisk Dishwasher safe: Bowl Extended Product Detail's 800 motor with six speeds and pulse setting - For quick and easy preparation with great results A large 5-litre, stainless-steel mixing bowl - So there is enough to share with family and friends Attachments included - It's easy to mix a variety of cakes and bat. KMix White Stand Mixer KMX50G Specifications. The Coconut White Stand Mixer kMix KMX50. The Kenwood Coconut White Stand Mixer kMix KMX50 is the perfect blend of colourful, retro styling and classic Kenwood reliability and performance. Very quiet, powerful food processor/kneading machine with 1200W max. 1 x Food processor. You can also set the mixing speed to suit the particular ingredients you’re working with. Die-cast mixing hook – consistent mixing even with larger amounts of dough. These are the most common reasons. Dough hook : Yes. Body material: Die cast aluminium. A minor defect which was easily repaired, such as a broken splash guard. Colour: White & silver. Parcels will require a signature. Condition is Used. G lass liquidiser. TurboTronic 2000W Food Stand Mixer Including 5L Stainless Steel Bowl, Hook, 'Y' Stirrer, Whisk TT-002. Introducing the most powerful and quickest TurboTronic stand mixer. 3 set of duty accessories: Whisk, Hook, ‘Y’ stirrer. 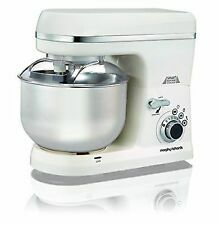 Morphy Richards 400020 Stand Mixer 1000W - White. 3.5 out of 5 stars - Morphy Richards 400020 Stand Mixer 1000W - White. 3 product ratings3 product ratings - Morphy Richards 400020 Stand Mixer 1000W - White. The Kenwood KM240SI Prospero stand mixer ensures that you can complete your food tasks with ease. 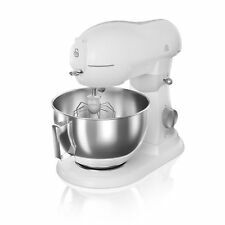 From kneading dough, to creating frosting, this mixer will help you create your favourite creations with ease. Kenwood MultiOne KHH321SI. Kenwood MultiOne Kitchen Machine | One Solution to Everything - YouTube. These are the most common reasons. Large capacity bowl for all your baking needs, with a k-beater, whisk and spiral dough hook. 8 speed settings, a pulse function and a stainless steel dough hook, beater and balloon whisk. Ideal for new bakers and seasoned professionals, the VonShef Stand Mixer makes baking simple. Designed to be low on noise and high on power the impressive 1000W motor - makes lightwork of mixing, whisking and kneading. Klarstein Bella Morena Kitchen Machine Food Processor 1200W 5 Litre. Use the dough hook one minute for kneading dough, and then the stirring hook the next minute for mixing tomato soup. Or use the whisk for the preparation of desserts. The Breville SHM2 Digital Twin Motor Stand and Hand Food mixer combine the high performance of a stand food mixer with the ease, speed and versatility of a hand food mixer. There is a choice of 10 speeds to choose from, and included with the SHM2 are beaters and dough hooks and a 3.2 L durable stainless steel bowl. 1200W Copper Die Cast Stand Mixer. The mixing bowl, splash guard and balloon whisk are all dishwasher safe for fuss-free cleaning. The stand mixer also includes an auto-shutoff feature which springs into action after 10 minutes for added safety. 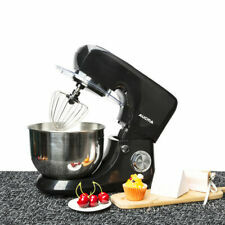 Kenwood Chef KM336 Mixer. - bowl has a few marks from use and whisk a couple of nibbles. Backed by KENWOOD'S legendary durability & reliability. Stainless Steel Bowl Tools. Stainless Steel Bowl. 4.6 ltr Stainless Bowl. Retro Stand Mixer Blue. This will need to be set up directly with the manufacturer. Details of this will be enclosed with the item. ÔÇØ ú %^& ()@,?. : Our system cant process these symbols and so there will be a hold up with your order . Light to heavy doughs - from biscuit to bread doughs - are easily accommodated, and you can just as easily mix cream and even egg whites. In addition, the pulse function enables you to gently fold other ingredients into egg whites. Dough hook: Perfect for mixing any heavy mixtures such as bread and short pastry, take the effort out of kneading. Perfect for rustling up a wide range of recipes, this versatile and practical appliance is the ultimate kitchen assistant.